Although I have referred to the location of the Baptist church and cemetery at Shiloh, I haven’t actually provided the technical information about the geographical coordinates for the nearby homesteads that Eliza Hope Dane Cartwright and her son Thomas Baskin Cartwright claimed in the 1870s. I thought it might be helpful to share some information with my Cartwright cousins so that you can follow up (to the extent that you are interested in doing so) to learn more about the original “home place” that these ancestors attempted to found in the last three decades of the 19th century. And someone might even choose to follow up to discover who the current owner is. Thanks in part to the kind of genealogical interest that many Americans of the Baby-Boomer generation have displayed, there is a series of “Family Maps” books that has been published that provides this kind of information. Gregory A. Boyd, J.D. 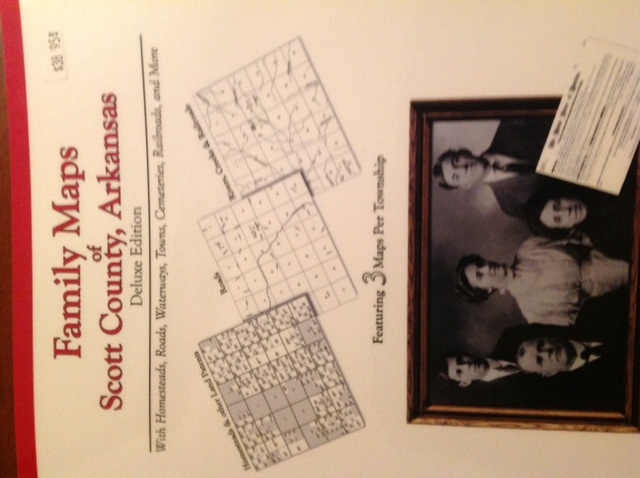 is the author of the book Family Maps of Scott County, Arkansas. The “deluxe edition” contains maps of the “Homesteads, Roads, Waterways, Towns, Cemeteries, Railroads, and More.” (Paul and I both have copies of this resource, which makes it possible to locate the earliest settlements of various families in Scott County, but does not track subsequent changes. You can find the map of the Shiloh area on pp. 302-307 (T1-N R 30-W 5th PM Meridian). Although perhaps not as pretty as the topographical maps that are available on Google and other search engines, this resource is keyed to the original surveys that laid out the sections of the townships. When you look at the location of the homestead claims, you see just how close Eliza’s farm was to the location of Shiloh Church, which was located to the northeast across the road from her neighbor John Starr’s homestead property and the property of Robert West, which was southeast of Eliza’s farm. 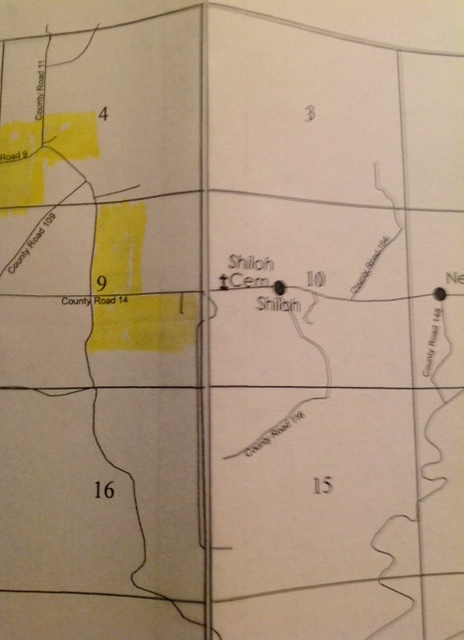 Although I suppose there may have been some changes to the way the roads cut through the area, Eliza’s property appears to have been located on either side of the road that runs roughly north and south (County Road 11) and the road that runs east and west (County Road 11) that today is known as “Shiloh Road” to the local focus. That would put it just across the road from the Nella Volunteer Fire Department. 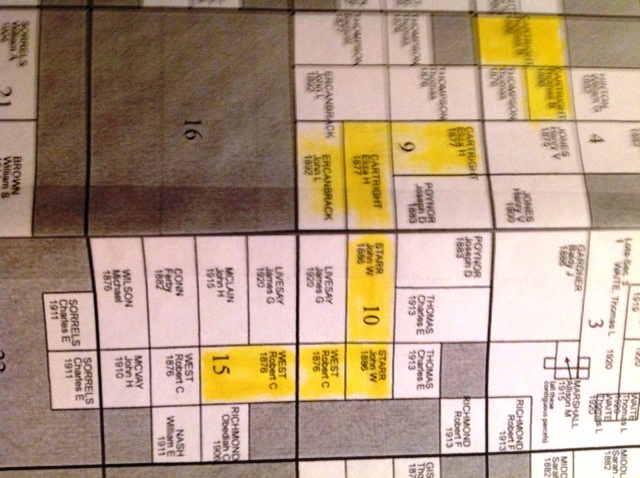 Eliza’s son Thomas’s property was located further north, on either side of the intersecting County Roads 9 and 11. In between, County Road 109 runs diagonally, intersecting County Road 14 and 11. If you follow the map further east, you see that the Black Fork and Clear Fork streams converge less than a mile to the East to form the Fourche LeFave River that meanders its way over to Hwy 71 just South of Waldron. The original homestead for Eliza in Section No. 9 in Township No. 1, of Range No. 30W. The original homestead for Thomas in Section No. 5, in Township No. 1, of Range No. 30W.